Detail of a statue in the Ashmolean Museum. 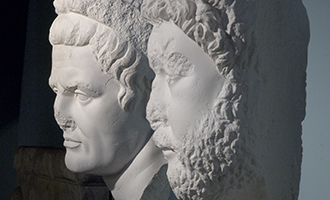 The course combines study of the history, archaeology and art of the classical world. It looks at the societies and cultures of the ancient Mediterranean through written texts, visual art and material remains, and has at its centre the two classical cultures of Greece and Rome. It is aimed at anyone interested in investigating ancient civilisations and their remains: from Greek temples and Roman amphitheatres to wall paintings and the poignant residues of everyday life. While it is primarily a historical and non-linguistic degree, ancient languages can be used and learned as part of the course. The degree is taught through a mixture of tutorials, lectures and classes. Some cover specifically archaeological or historical approaches to ancient Mediterranean cultures, but the degree is unique in also offering courses that combine both approaches. In every year of the course there are classes led by both an archaeologist and a historian, which are designed to give an integrated, interdisciplinary approach to the topics studied. The University’s resources for this combined subject are excellent in terms of both library facilities, especially the Sackler Library, and the range and number of post-holders in the two fields. The Ashmolean Museum also contains wide-ranging collections of art and artefacts from classical cultures. There are two practical elements – two weeks at the end of the first year spent on an archaeological field project, and the preparation of a report in the second and third years focusing either on a particular ancient site or on an artefact or set of artefacts in a museum of your choice. Fieldwork projects recently attended by CAAH students include: Sangro Valley Project, Abruzzo, Italy; Halaesa, Sicily, Italy; Sanisera Field School, Menorca, Spain and Thouria, Kalamata, Greece. Greek or Latin language papers. Tutorials are usually two students (possibly three) and a tutor. For the core papers the class size is usually eight or less. Where options are taught in classes, the class size will depend on the options you choose. They would usually be no more than 20 students. Most tutorials, classes, and lectures are delivered by staff who are tutors in their subject. Many are world-leading experts with years of experience in teaching and research. Some teaching may also be delivered by postgraduate students who are studying at doctorate level. To find out more about how our teaching year is structured, visit our Academic Year page. For more information, visit the Classical Archaeology and Ancient History website. The content and format of this course may change in some circumstances. Read further information about potential course changes. Helpful: A classical language, Classical Civilisation or Ancient History can be helpful to students in completing this course, although they are not required for admission. If, and only if, you have chosen to take any science A-levels, we expect you to take and pass the practical component in addition to meeting any overall grade requirement. If English is not your first language you may also need to meet our English language requirements. All candidates must follow the application procedure as shown in applying to Oxford. The information below gives specific details for students applying for this course. You do not need to take a written test as part of an application for this course. Description: Two pieces which have been recently marked in the normal process of school or college work. See further guidance on the submission of written work. Tutors are looking for intellectual potential, the specific visual, textual and reasoning abilities required for this course and, of course, serious interest in and commitment to both classical archaeology and ancient history. Tutors will consider all the available information – past and predicted examination results, the personal statement, academic reference, submitted written work and interviews – to assess your potential to benefit from the course, to be a good tutorial student, and to attain good results in examinations. For more detail on the selection criteria for this course, please see the Classics website. Latest information for UK undergraduates who will begin their course in 2020 can be found here. Arrangements for EU students starting in 2020 have not yet been confirmed. Read the latest information. The fees and funding information below relates to those who will start at Oxford in 2019. These annual fees are for full-time students who begin this undergraduate course here in 2019. For more information please refer to our course fees page. Fees will usually increase annually. For details, please see our guidance on likely increases to fees and charges. EU applicants should refer to our dedicated webpage for details of the implications of the UK’s plans to leave the European Union. Living costs at Oxford might be less than you’d expect, as our world-class resources and college provision can help keep costs down. Living costs for the academic year starting in 2019 are estimated to be between £1,058 and £1,643 for each month you are in Oxford. Our academic year is made up of three eight-week terms, so you would not usually need to be in Oxford for much more than six months of the year but may wish to budget over a nine-month period to ensure you also have sufficient funds during the holidays to meet essential costs. For further details please visit our living costs webpage. A tuition fee loan is available from the UK government to cover course fees in full for Home (UK)/EU students undertaking their first undergraduate degree*, so you don’t need to pay your course fees up front. In 2019 Oxford is offering one of the most generous bursary packages of any UK university to those on a family income of around £42,875 or less, with additional opportunities available to those from households with incomes of £16,000 or less. This support is available in addition to the government living costs support. See further details. Islands students are entitled to different support to that of students from the rest of the UK. Please refer to the "Other Scholarships" section of our Oxford Bursaries and Scholarships page. You can choose an alternative location if you wish, subject to the approval of the CAAH standing committee. The cost of participating in fieldwork may be anything from £500 to £2,500, depending on your choice of fieldwork project. All CAAH students starting in 2019 will receive a fieldwork grant of up to £1,000 from the faculty. The Key Information Sets provides applicants with statistics about undergraduate life at Oxford. But there is so much more to an Oxford degree that the numbers can’t convey. College tutorials are central to teaching at Oxford. Typically, they take place in your college and are led by your academic tutor(s) who teach as well as do their own research. Students will also receive teaching in a variety of other ways, depending on the course. This will include lectures and classes, and may include laboratory work and fieldwork. However, tutorials offer a level of personalised attention from academic experts unavailable at most universities. During tutorials (normally lasting an hour), college subject tutors will give you and one or two tutorial partners feedback on prepared work and cover a topic in depth. The other student(s) in your college tutorials will be from your year group, doing the same course as you and will normally be at your college. Such regular and rigorous academic discussion develops and facilitates learning in a way that isn’t possible through lectures alone. Tutorials also allow for close progress monitoring so tutors can quickly provide additional support if necessary. Our colleges are at the heart of Oxford’s reputation as one of the best universities in the world. At Oxford, everyone is a member of a college as well as their subject department(s) and the University. Students therefore have both the benefits of belonging to a large, renowned institution and to a small and friendly academic community. Each college or hall is made up of academic and support staff, and students. Colleges provide a safe, supportive environment leaving you free to focus on your studies, enjoy time with friends and make the most of the huge variety of opportunities. Common room (known as the JCR). All first year students are offered college accommodation either on the main site of their college or in a nearby college annexe. This means that your neighbours will also be ‘freshers’ and new to life at Oxford. This accommodation is guaranteed, so you don’t need to worry about finding somewhere to live after accepting a place here, all of this is organised for you before you arrive. All colleges offer at least one further year of accommodation and some offer it for the entire duration of your degree. You may choose to take up the option to live in your college for the whole of your time at Oxford, or you might decide to arrange your own accommodation after your first year – perhaps because you want to live with friends from other colleges. While college academic tutors primarily support your academic development, you can also ask their advice on other things. Lots of other college staff including welfare officers help students settle in and are available to offer guidance on practical or health matters. Current students also actively support students in earlier years, sometimes as part of a college ‘family’ or as peer supporters trained by the University’s Counselling Service. Want to find out more about the the ancient world? Why not explore some websites which have excellent links to historical and archaeological materials, such as the British Museum or Oxford’s own Ashmolean Museum. You could also have a look at BBC Radio 4's archives, for example for the programme In Our Time which covers material from Ancient Greece and Ancient Rome. There are also many social media sites which you can have a look at such as Classics Confidential and Classics Outreach.